I made a tomato-florentine soup last night for dinner. And in doing so, I was reminded of the importance of eating a little Vitamin C rich food, along with leafy green veggies. Leafy greens, like spinach, are a fair source of iron. However, the iron in spinach is non-heme (as opposed to heme iron in meat). And non-heme iron is difficult to absorb on it's own. However, if you consume a little Vitamin C along with the non-heme iron food (in this case spinach), your body can more readily absorb the iron in the spinach. There are many recipes which combine a Vitamin C food with spinach. In many Mediterranean countries, cooked spinach is served dressed with olive oil and fresh-squeezed lemon juice. The lemon juice provides enough Vitamin C to help with the non-heme iron absorption. 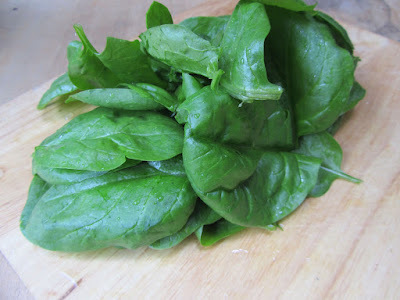 There's a popular spinach salad, currently, that uses a dressing of olive oil, vinegar and pureed fresh strawberries. The strawberries are a good source of Vitamin C and aid in iron-absorption from the spinach in the salad. I recently tasted a pasta salad that had fresh baby spinach and fresh cherry tomatoes in with the pasta and dressing. The cherry tomatoes (and all tomatoes) are a source of Vitamin C.
Italian cooking often times includes some spinach along with a tomato-based sauce. Florentine, or a la Florentine, is often synonymous with spinach-added (although not always, as in florentine cookies -- spinach in those would just be gross). Fresh or cooked tomatoes are often served in, or along side, Florentine dishes, such as whole tomatoes, stuffed with a mixture of spinach, bread crumbs, onions and cheese, known as Florentine Tomatoes. The soup I made last night, Tomato-Florentine soup combined some leaves of fresh baby spinach, with the tomato puree from canned tomatoes. Canned tomatoes hold on to a good amount of their Vitamin C, even after the canning process. 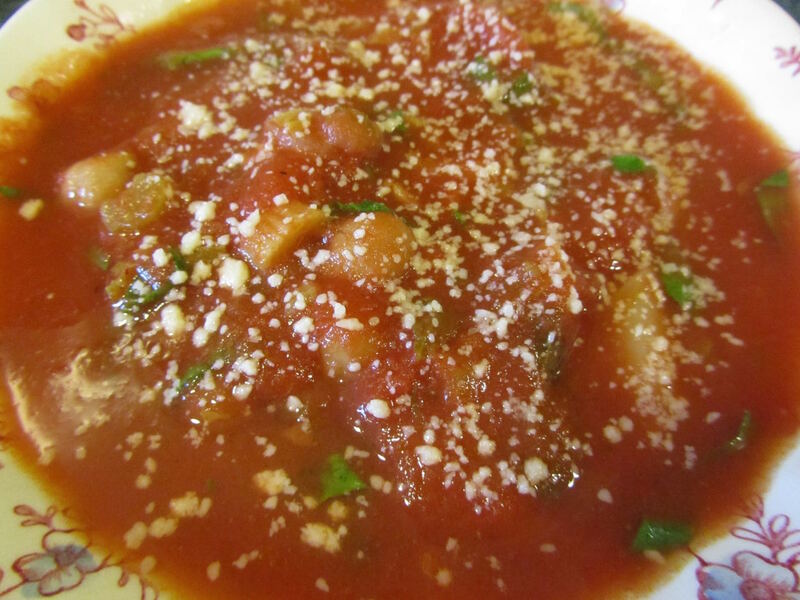 1 cup of canned, stewed, red tomatoes contains 34% of the US RDA of Vitamin C.
If the soup tastes "flat" try adding a bit more onion powder, garlic powder, oregano and a pinch of salt. While fresh tomatoes are still months away, in my garden. From mid-May through June, I usually have a lot of baby spinach. Fortunately, canned tomato products are very affordable, even on a tight budget. When I was little, Popeye cartoons were very popular. My mom would cajole us into eating our spinach by singing the "I'm Popeye the Sailor Man" song. She'd remind us of how Popeye would squeeze open a can of spinach and gulp it down. Of course, with what I know now, Popeye really should have been chasing his cans of spinach with a glass of tomato juice. Spinach and tomatoes--two of my favorite foods. I haven't had any for a long time, but I really liked canned spinach when I was growing up. Iron absorption and vitamin C is an important thing to understand. That's why if you are anemic enough to require iron supplements, they work better if vitamin C is added. BTW, I think everyone knows this but too much iron in your blood can be dangerous. Talk with your doctor before taking any iron pills. In the meantime, make Lili's soup. Looks like a delicious recipe. Yes, and confusingly enough, some of the symptoms of iron overload are similar to those of iron deficiency, like fatigue -- can be present with either too high iron levels or too low. For most folks, it's difficult to achieve too high levels of iron by diet alone. I tend to favor getting nutrients from foods (as opposed to taking loads of supplements), for that reason, as well as I think there are nutrients in foods that are yet to be named/included in supplements. OK, today you're talking things I know nothing about! What I do know is that dad plants like tomatoes and spinach and everything else and I eat them, preserve them, and serve them! Another thing I know is that my youngest college child comes home and asks for tomatoes and spinach and "anything else" that is a raw vegetable that is good for munching on but can also be used for cooking. She makes herself a lunch of broth and noodles and throws in a handful of raw sliced carrots, celery and spinach. She takes a picture of it and sends it to me at work. She wants raw tomatoes and spinach sandwiches and now I don't know whose child this is because she wouldn't touch those growing up unless I hid them in casseroles and soups. Too funny! Your daughter's tastes suddenly matured! Fortunately for you, your dad's garden can supply a lot of fresh veggies, once the season gets underway. My husband made tomato basil soup today, again, and we ate that with basil pesto pizza, talk about basil overload, but we love basil. Using spinach in a tomato soup sounds excellent too. The concern I have with eating raw spinach in salads or sandwiches, is the oxalic acid that is absorbed and which binds with calcium, therefore increasing your dietary calcium requirement if eaten raw and in large quantities, or repeatedly over several days. Cooking helps breakdown the acid, so it is better to eat spinach this way, but those warehouse bags of spinach always worries me. You pay dearly for fresh spinach, the last thing you want to do with the bag is cook it. Good reminder about getting enough vitamin c to help with absorption of iron, forgot that bit of info...sometime it is boggling what is good/bad and how much etc etc. I had a thought the other day, a food compound can be both good and bad, but your body has a way of absorbing, storing and secreting what it needs and doesn't need, so why do we worry and debate whether eating a particular food is good or bad? I recall the best advice is to eat a variety and in moderation. I also agree with your comment that food is best, not supplementation, for the same reason that there are beneficial nutrients in foods not identified yet, and many more foods that we could but don't eat per our custom and habits. Yummy! I love tomato-basil soup. I'll have to wait another month for my basil, here. But I can practically taste it! Do you know what I find interesting? How many cultures have traditionally paired the right foods together, without having the scientific knowledge to do so. Like the tomato-spinach, or lemon-spinach, for iron absorption. Or beans and rice, beans and corn, for maximum vegetarian protein. The building blocks for good health have been provided for, and many cultures have naturally adopted the correct combinations of those. Actually, our body does a good job of regulating what we eat if we are healthy, not in a disease state. Just thought I should correct my comment above. Being overweight seems to be the risk that pushes us into a diseased state. Google Iron Fish. It is an ingot that is being used in Asia to assist in increasing iron in the diet. It's an iron ingot shaped like a fish, a good luck symbol in Asia. They distribute through NGO's and it is used in the cooking water with a few drops of citrus juice. It can assist in increasing iron in the diet. If used for cooking water or in broths it increases the dietary iron. I saw those just recently. Also, the old standby, cooking in cast-iron pans.